Summit Roofing and Siding Contractors was founded in 2005 by Sean McDonald with the goal of providing professional, easy-to-understand roofing and siding solutions for homeowners and businesses in Montco, Delco, Bucks and Chester County. Our team prides ourselves on performing every installation according to manufacturer specifications to ensure that the work is done right the first time. Consistent, positive feedback has been recognized by leading consumer website Angie’s List who has named Summit Roofing and Siding Contractors as a Super Service Award winner for the past several years. Every Summit Roofing and Siding Contractors task is handled with expertise, pride, and care. With a project as important as the roof over your home, you can trust the reliability and experience of the Summit Roofing and Siding Contractors team. A native to Chalfont, PA, Sean McDonald has worked with Summit Roofing and Siding Contractors for nearly a decade and has been in the residential and commercial roofing business for 22 years. He has worked in all aspects of the industry from full roof installations to minor repairs. Sean has also installed seamless gutters and vinyl siding. He’s also comfortable working with many different types of materials on the job from fiber cement siding, to metal roofing and more. Sean’s special certification and qualifications as owner of Summit Roofing and Siding Contractors include certification as an Owens Corning Preferred Contractor, GAF Certified Roofer and CertainTeed Shingle Master as well as many others. His typical day to day includes handling many aspects of running operations and being involved in sales, marketing and project management. Sean loves being the owner of Summit Roofing and Siding Contractors and running his own business. He also enjoys the satisfaction of giving customers the quality and customer service they deserve. Outside of work, Sean loves spending time with his family, watching his kids soccer games and softball games. He also enjoys deep sea fishing, and completing projects on his house. Photos of any areas for review. Long Term Cost Savings: By conducting this yearly service, potential problems can be identified earlier – saving on potential future repair work. As a result, you’ll never make another emergency roofing call! Priority scheduling for all future inspections or work. Discounts on additional projects (small or large). Ongoing tips to keep your home’s exterior in great shape! Here at Summit Roofing and Siding Contractors, we want our customers to feel secure in their decision to upgrade their roofs, siding, and gutters. 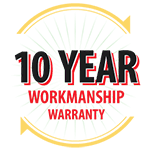 That's why we offer a 10 year workmanship warranty on all of the services we provide. You can rest easy knowing that we'll be there when you need us!